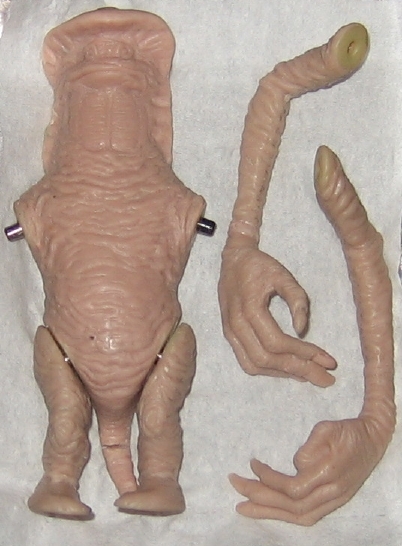 This is a wax sculpt for the Amanaman figure from Kenner's Star War Power of the Force line. This is by far my favorite action figure sculpt from all in the entire Star Wars line. The scale of the figure and the texture detail in the creature's skin is at a level beyond any other from the early years of the line. Since so few figure sculpts survived until today, it's fortunate that the one the highest quality pieces from the Kenner sculpting department survived the years. The second image shows the Amanaman sculpt alongside companion prototypes including an unpainted hardcopy, paint master (painted hardcopy), signed sample, first shot, and plastic swatch (for matching plastic colors in the factory).